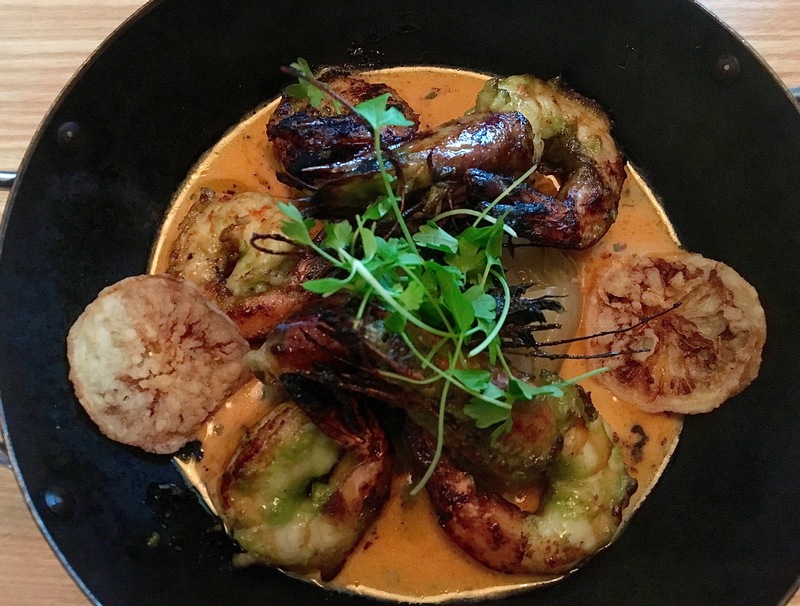 Chef Doug Turbush is the King Midas of East Cobb restaurants. First he planted a Seed in Merchant’s Walk, which quickly became a foodie fave, but left us unimpressed the two times we visited. Seed spawned Stem, a wine bar that we really enjoyed. 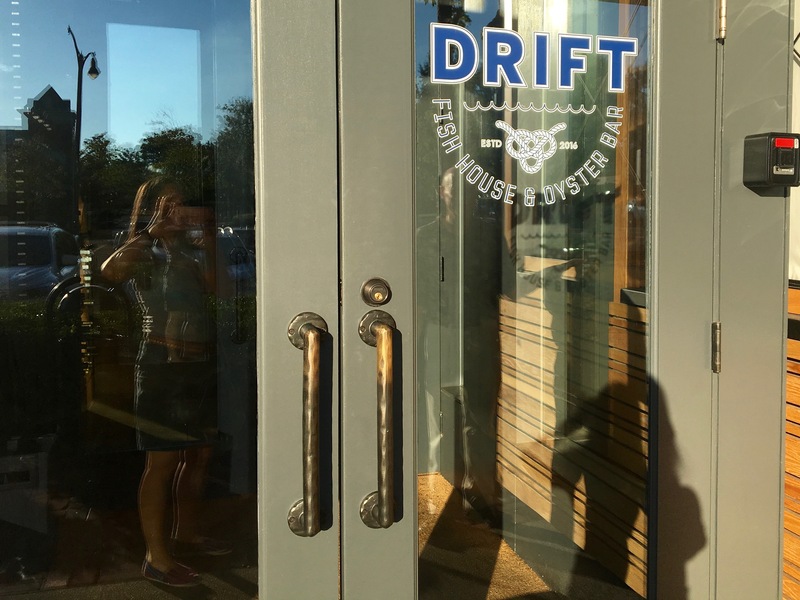 Now Turbush has opened a third location, Drift, which is about a half-mile from his first two restaurants. 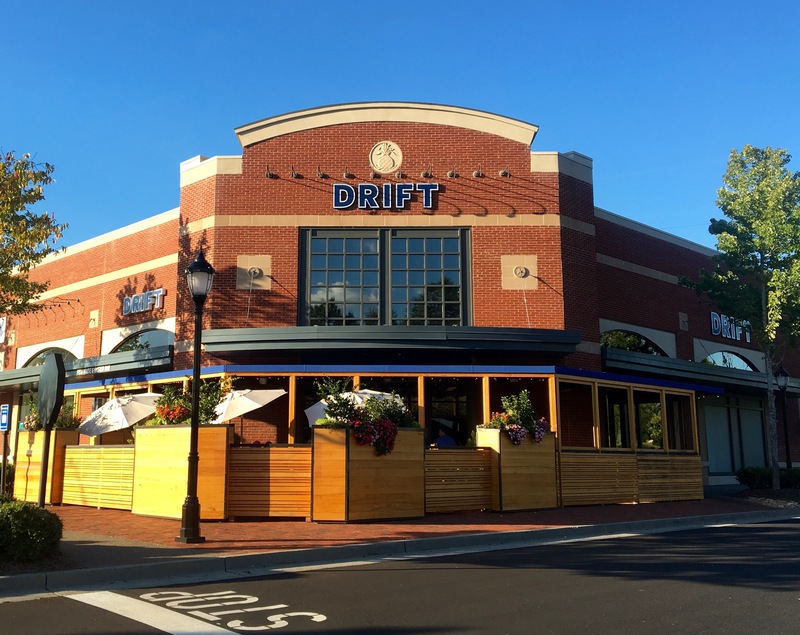 Tonight, we check out Drift to see which way the currents flow at Turbush’s latest East Cobb eatery. Let’s throw out our line and see what we can catch. Seafood puns are so easy to come up with. Beware, there may be more. Eve takes an “Alfred Hitchcock moment” just before we go in, making a cameo appearance in her photo. Technically, it’s “Drift Fish House and Oyster Bar”. It’s also Cobb Restaurant Week, which means we can each sample three courses from a fixed menu for $35. That’s not bad for an appetizer, entree and dessert. Date Night is all about value. And beer. Let’s start off with two of our favorites. 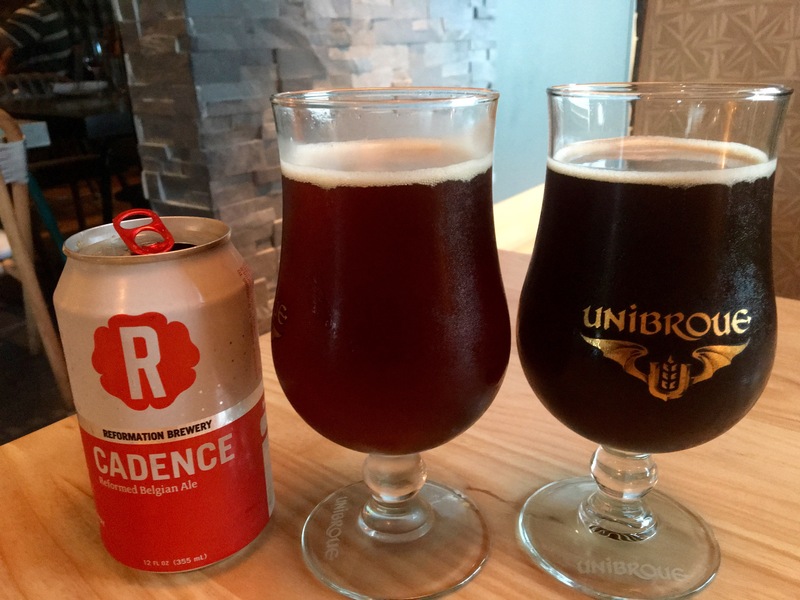 Reformation Cadence makes a lot of appearances during Date Night because it’s one of the best locally-produced beers that we know. Unibroue beer is from Canada, and we recently spent a lot of time with this beer when we were in Montreal over the summer. Their Trois Pistoles is dark, Belgian, and very satisfying. It’s hard to find on draft in the USA, but Drift has it. Before we order, let’s take a look around the port. There’s a bar when you walk in where the beautiful people hang out. It’s as busy in the bar as it is in the dining room. You can eat at the bar as well. There’s lots of wood, lots of stone, and many very competent servers in checked shirts. 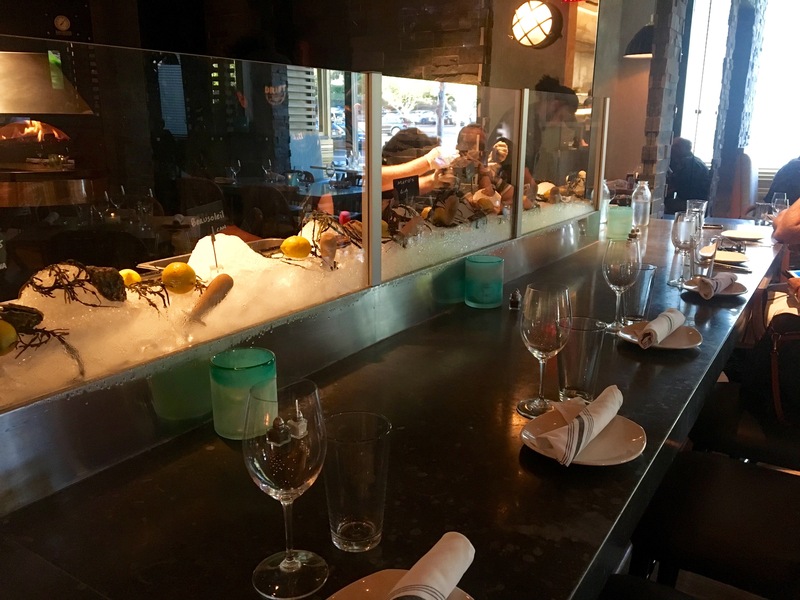 If you want extra entertainment with your meal, you can sit at the oyster bar, where they keep the mollusks on ice for all to see. 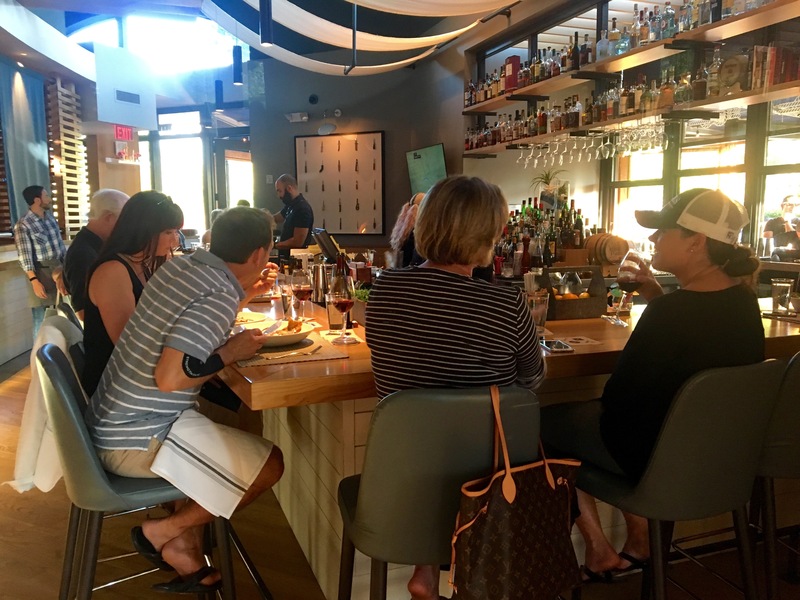 Because it’s Cobb Restaurant Week (take that Inside-The-Perimeter places–we have a restaurant week in Cobb County! ), we can order much more food than we usually get. 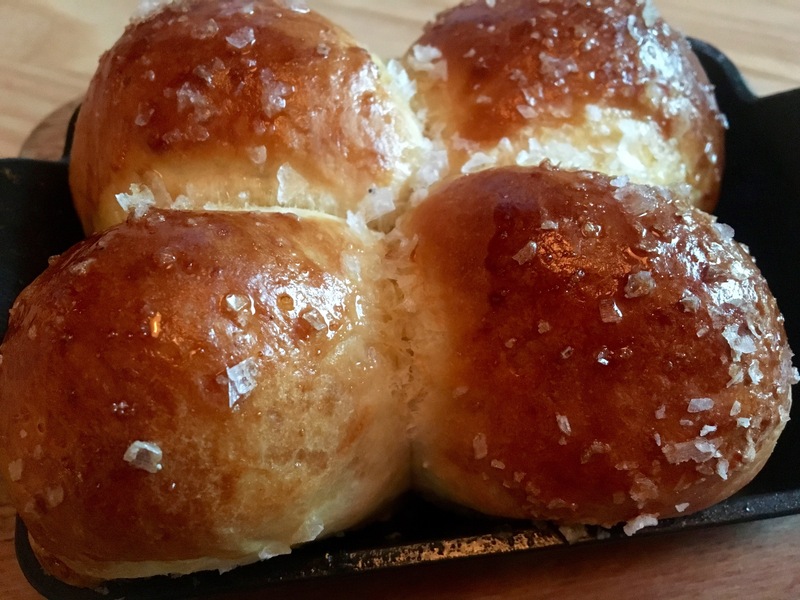 The Parker House rolls aren’t on the tasting menu, but what a great way to start. Most places bring you bread, but Drift makes you pay for it. These are hot and buttery, and probably worth the four dollars. We each get an appetizer. Eve throws the net and comes up with some wood-fired shrimp. These are excellent shrimp, with a smoky taste from the wood. The star of the plate is the little pieces of fried lemon, which are surprisingly sweet. I reel in a seafood gumbo. This is sort of a deconstructed gumbo. 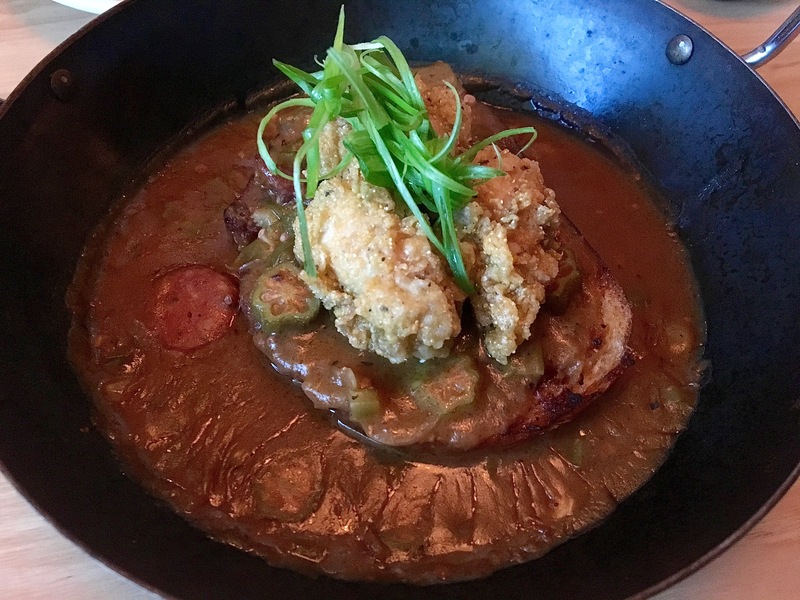 The fried oysters and okra sit atop a piece of French bread, which in turn sits in the gumbo roux with the andouille sausage. This is certainly unconventional, but it works. Something else that works is the Bay of Fundy (found in your atlas between Nova Scotia and New Brunswick) salmon, which Eve hooks for her main course. 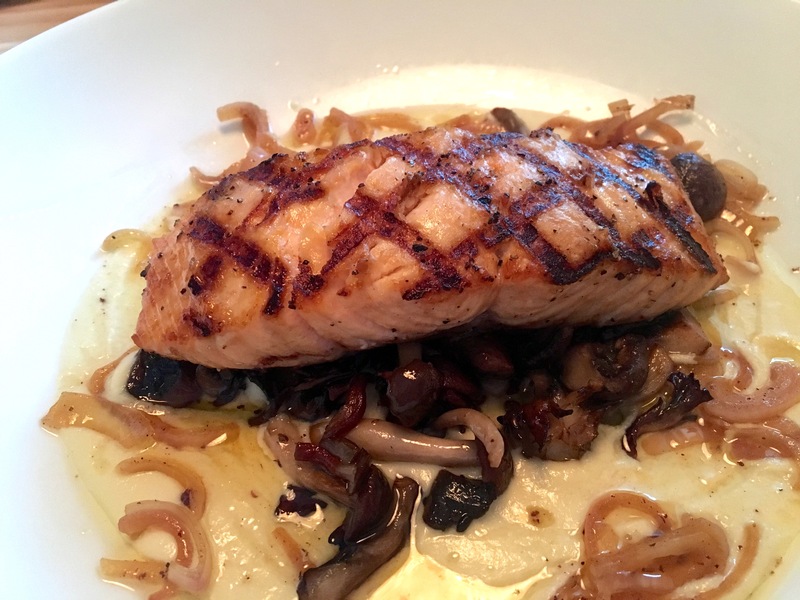 Although the salmon is perfectly cooked to medium, the mushrooms that come with it are amazing. This is a great seafood entree. 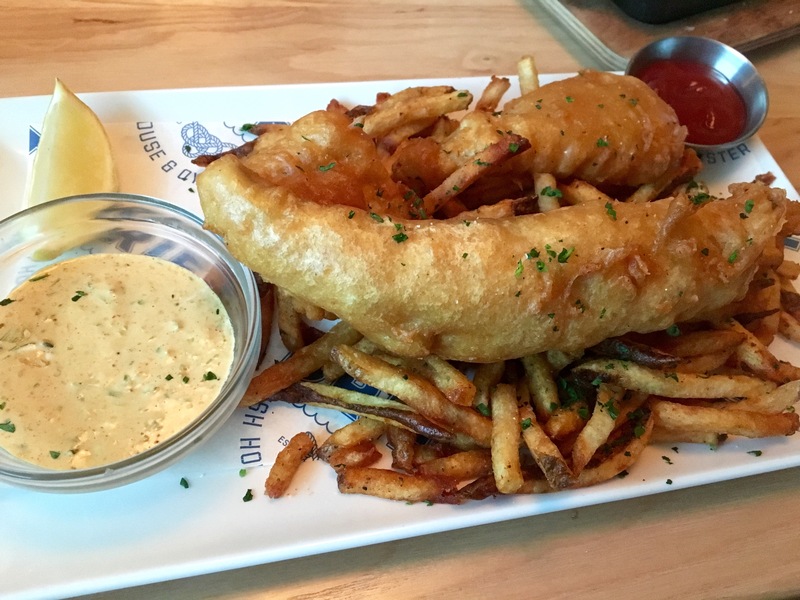 Haddock is a favorite fish in the northeast. You don’t have to drive that far to get it locally as fish and chips. Well, at least the salmon is good for us. We pile on the calories with this one, but it’s worth it. It’s hot, it’s moist on the inside and crunchy on the outside, and it really floats our boat. Because we haven’t done enough caloric damage tonight, we both have a dessert coming. The desserts are made by the Seed/Stem pastry chef, who must be very busy. 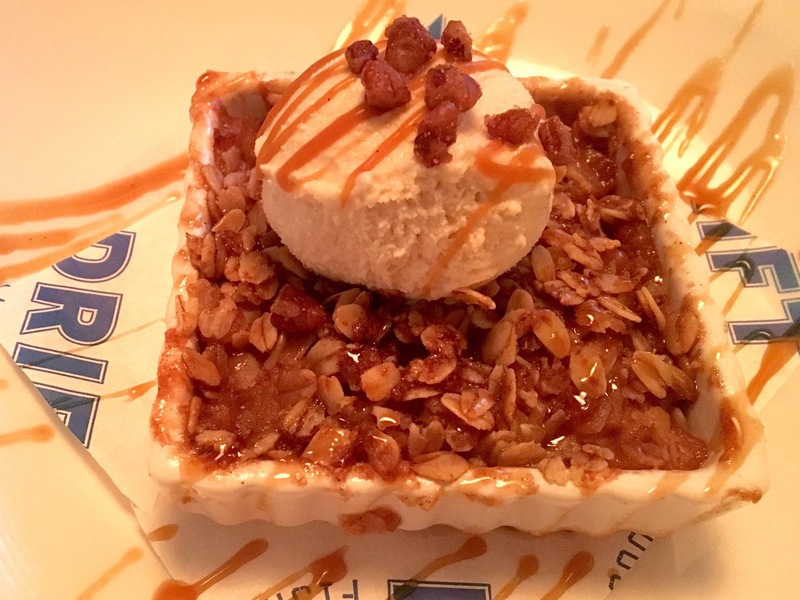 Here’s another use for their wood-fired oven–make apple crisp in it. Then top it with some bourbon pecan ice cream. Delicious. There’s one more dessert offering from the menu. 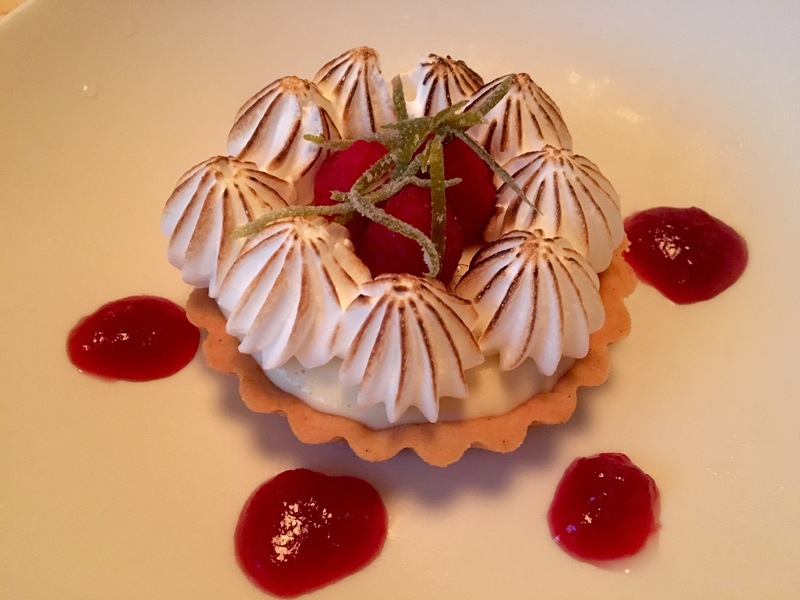 The key lime tart is very refreshing after fried food. It’s tart, and it cleanses the palate. The pastry shell is light and fluffy. This is a good dessert on a hot night. 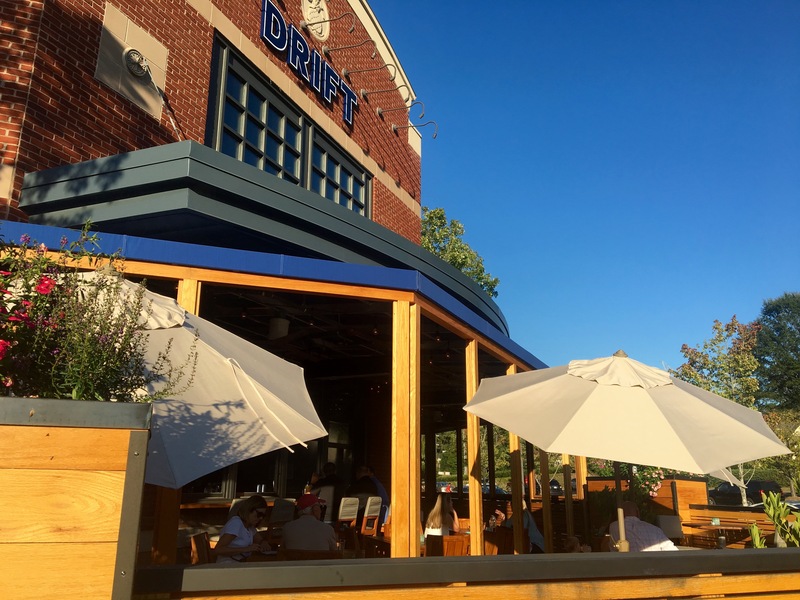 The bottom line on Drift: Head your flotilla to the Avenue in East Cobb and eat away. 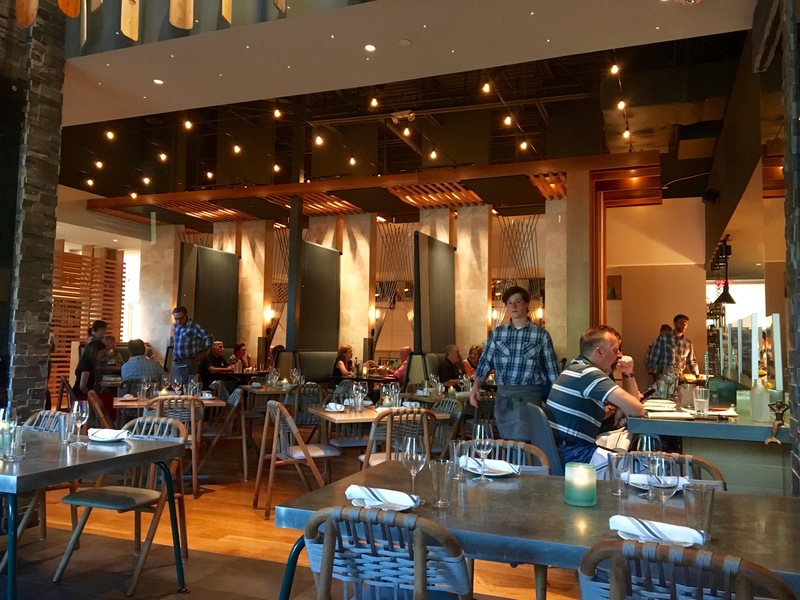 Our server was great, our meal was perfect and we really enjoyed our date at Drift. It’s a little pricey, but perfect for special occasions like my birthday, which is what we celebrated here. All of this excellent food is only two miles from our house. Why go inside The Perimeter? We’ll be back.